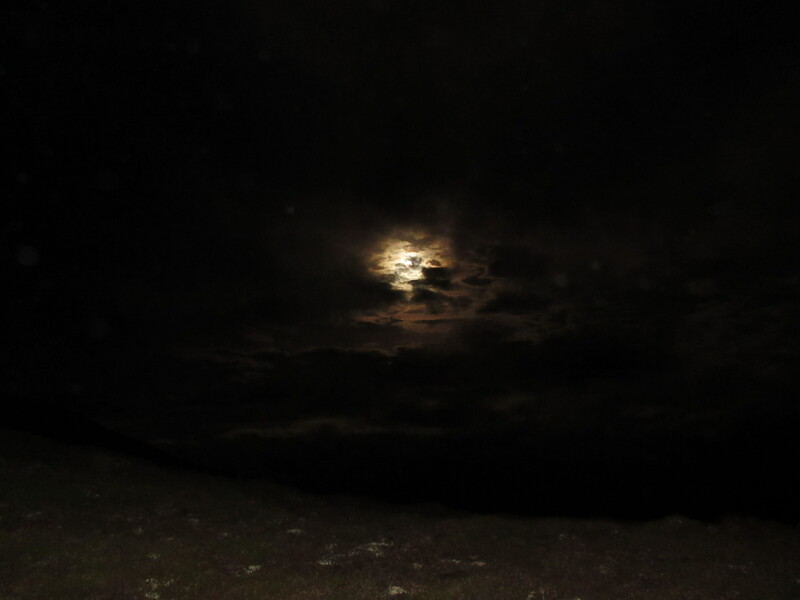 THE mountain of mist lived up to its name, but despite a night that provided merely a fleeting interaction with the full moon, Beinn a' Ghlo was still a realm for the senses. This sprawling upland of three Munros and copious corries is a notorious vapour magnet. Even on the most perfect of days it can have ribbons of gauze wrapped around its shoulders, caressing the slopes like an infatuated lover, while neighbouring peaks are cloud-free. Sometimes this can be the very fibre of its beauty, the constantly shifting views, the tantalising glimpses of what lies ahead. My last night trek here five years ago was a fine example. Reaching the summit of Carn Liath we found only grey, and yet within minutes the mists twisted and swirled, eventually lifting like the curtain at a cinema from a bygone era to welcome in the most spectacular and colourful sunrise I have ever seen. I had hoped for a replay of this scene when I went in search of the Harvest Moon, the tenth full moon walk of the year. It was an outing to be shoehorned in between storms. The previous week had seen destructive winds that restricted mountain walks in much of the country. My original choice for this walk had been the remote A'Mhaighdean, The Maiden, a reference not to its purity but to the fact that it is said to look from some angles like a bound stook of corn (the last sheaf to be cut at harvest was called the maiden). Poetic that may have been, but it's a long way in and out, and with more wet and stormy conditions piling into the west I couldn't afford a hike of 12 hours or more. The better bet was Beinn a' Ghlo, a shorter journey and the promise of settled weather, a mountain I know well through its many moods. It's also at the heart of farming country, and, as a further concession, I was accompanied up the A9 by Neil Young singing Harvest Moon. The moon seemed to be suffering from shyness, but I did catch a few sightings en route. By the time I arrived at Loch Moraig, it was nowhere to be seen but its influence was evident. The mountains ahead were standing out clearly under a mottled grey sky, the track leading to them a glowing silver streak. Behind the hills were white candy floss towers, distant reminders that these benign conditions were transient. I stepped out of the car and was immediately assailed by the roaring of stags, their territorial warnings cutting through the still night. They could have been five miles away, they could have been a few hundred metres; there was no way of telling in this outdoor echo chamber. 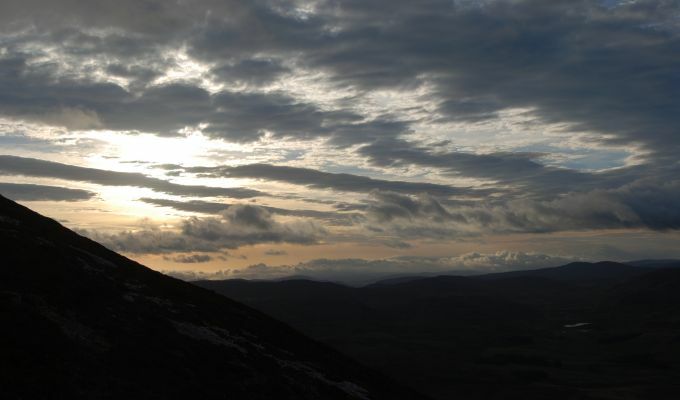 The path up Carn Liath had been neatly repaired in the lower reaches, and the Mend Our Mountains appeal should ensure that the unsightly scree scars higher up will soon be massaged into something more conducive for such a jewel of a mountain. About halfway up, the Harvest Moon suddenly revealed itself and I was able to walk with the torch off. At one point, I thought I saw a torch moving steadily up the hill behind me, but it vanished when the mists blew in and I never saw another sign of anyone. By the the time I hit the final rise, the temperature had plummeted. I layered up at the cairn; six top layers, two bottom, a balaclava, hat and hood, winter gloves with liners, winter socks and boots. It may have been September, but I needed them all. The walk towards the second summit, Braigh Coire Chruinn-bhalgain, gave me hope, the gloom lifting, the moon poking through again. It was short-lived. The final push to the summit was blind, a compass reading the only clue to my destination, the head torch rendered impotent, light bouncing back from the grey and black. I abandoned any thought of heading on to the third peak. 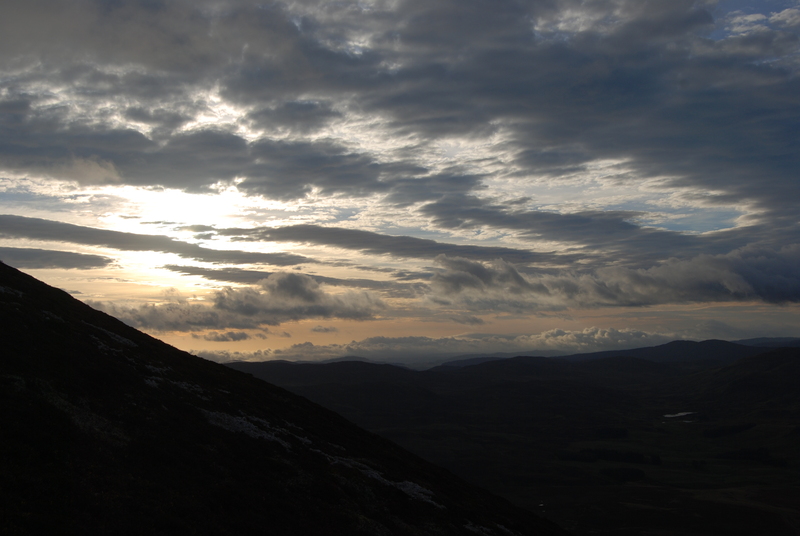 Finding the turn off the ridge would be tricky; safer to head back the way I came and hopefully reach Carn Liath for the sunrise. I wasn't here for the ticks. A distant horizontal strip of red proved to be a false dawn. I made it back to the first summit in time but the sunrise was hidden by the all-enveloping mists. There was the occasional promise of a light show to come, and for a few seconds the mist took on a pulsating orange glow, hypnotic and slightly spooky, but it never developed any further. I sat it out at the cairn for around 45 minutes but in the end my optimism counted for nothing and all I got was a feeling akin to frostbite. It was time to call it a night. Needless to say, about half an hour after I dropped down the cloud started to shift. I consoled myself with the thought that had I stayed up there this would never have happened.